For the first time in recent memory, the Indiana Democratic Party held its state convention outside of Indianapolis, choosing the Grand Wayne Center in Fort Wayne to host its prestigious meeting of delegates. Feedback from the convention couldn’t have been better for the Summit City, as thousands of Democrats from all over the state met downtown, conducting business and partaking in a handful of area events. 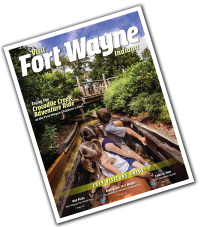 According to convention officials, an estimated 3,000 people, including delegates and their families, visited Fort Wayne from June 13-17, spending $500,000 during their stay. In addition to official business, attendees observed the new Dr. Martin Luther King Jr. Memorial Bridge, and enjoyed the Foellinger-Freimann Botanical Conservatory and Fort Wayne Children’s Zoo, in addition to eating at the annual BBQ Ribfest and watching the TinCaps pullout a victory.